In 1908, William Brandon Carmody played his only senior VFL game in the early stages of a football journey that took him from Prahran in the VFA to Carlton, and then on to at least five other clubs - North Melbourne, Port Melbourne, Ascot Vale, Collingwood and Footscray. 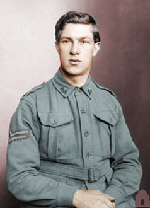 All of that occurred prior to 1915, when he volunteered for front-line service with the Australian Army in World War 1. More than a century after his one and only appearance in navy blue, Bill’s football and military exploits were chronicled by Tony De Bolfo, in the following article that appeared on the club’s website on 25 November, 2011. "As a 19 year-old, Bill was recruited from Prahran and played one game for Carlton, named in a forward pocket in round 7, 1908 against Geelong at Princes Park (Monday June 8, being a holiday celebrating the Prince of Wales birthday). It was Carlton’s 200th match, which it won by more than 10 goals. Bill had stints at North Melbourne, Port Melbourne, Ascot Vale and Collingwood, before transferring to Footscray (VFA) in May 1915. Within months he had ‘joined up’. Private William Brendon Carmody enlisted with the AIF in Melbourne on July 15, 1915 (No. 2329), and was posted to the 5th Reinforcements, 22nd Battalion on September 1 that year. On 24 July, 1916 he was involved in the fierce battle of Pozieres, a village in the Somme Valley, where the town was destroyed. In this battle, Bill was shot through the mouth, described as ‘a severe gunshot wound to the face’ with some of the shrapnel passing from one side through his mouth to the other. According to his daughter Pat, he was left in the trench, presumed dead, but was able to crawl back to the Australian line. Bill recovered, volunteered to return to France with the medical corps (stretcher bearer and ambulance driver), finally returning to Australia in July 1919." The 219th player to represent the Old Dark Navy Blues, Bill Carmody passed away at Brighton on 7 April, 1953, aged 64. 1910 June 15: The VFL gave W. Carmody a permit to transfer from Carlton to North Melbourne. Contributors to this page: Jarusa , molsey , PatsFitztrick , blueycarlton , pblue , Bombasheldon , tmd1 , keogh , true_blue24 and admin . Page last modified on Wednesday 22 of January, 2014 00:11:19 AEDT by Jarusa.